The all new CLEON MMX '11 is here, you're weapon to win races! Choose the options in the selection box you prefer to order along. The new CLEON MMX is the result of a full re-design of the Cleon 2008. Each part has been re-designed and is improved where possible. Higher grade materials make the car more robust and reliable than ever before. Maintance has become easier and building the car is less complex. 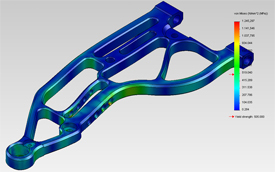 Parts are designed for racing conditions, using the latest techniques like stress analysis to check on impacts. Quicker in set-up with easy access to key points for adjustments. Plus more set-up options than ever before are gathered in this design. But even more important, the car handles and performes so much easier. Directly "out-of-the-box" the car will compete front row in races. There are several set-up sheets possible to download, simply click on the download tab to view them. These can be of a good help, or can function as a starting point getting your set-up right. Also you can download a blanc set-up sheet to keep track on your own settings. Even though the car is a bit longer, the total weight of the car was further reduced. Less weight is a key factor for race minded pilots! It allows you better control over your car and at the same time keeps your car more responsive to commands. Next to the pure racer also the demanding hobbyist will enjoy this high-end model. Building the car is just as much fun and easy as to drive it! At the same download tab you will find also the manual to fully build the car yourself. This manual is not only a help for building, it can also give you a better insight of all the features the car has. For those who wish not to build the car themselves, feel free to contact us. We can build the car for you when desired, fully after your personal wish. As our philosophy is based on offering a dureable product, meeting the highest standards. We deliver you the same parts of same quality as we use ourselves at the highest level in the racing scene. It makes no sense in our opinion to offer a cheaper car that needs many upgrade parts. We firmly believe going the quality route is in the end cheaper, but foremost: it will provide you so much more pleasure with the hobby! The car comes without engine and without the electronics. These need to be ordered seperately. 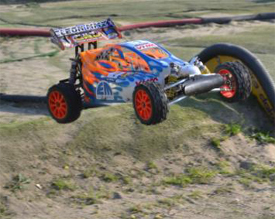 With the above mentioned dimensions the CLEON MMX is a full race legal off-road buggy according the EFRA regulations for 1/6th scale models. With its dimensions it also fits in all European rules set for 1/6th scale buggies.